When the giraffe was first introduced to humans, they classified it as a cameleopard for its resemblance of a camel and having markings like that of a leopard. Giraffes were first captured by man in the Egyptian times and sent to royalty in hopes of having a malicious animal for gladiators. Their magnificent plan soon backfired. They quickly found that giraffes, despite their intimidating large size, are in fact a very peaceful species. They were then put on display by the wealthy for public observation. In 1414, the first giraffe was placed in a Ming Dynasty zoo in China. Giraffes held traditions in many societies. Bushmen of southern Africa have medicinal dances named after some subspecies. They were performed in hopes of correcting human head alignments. 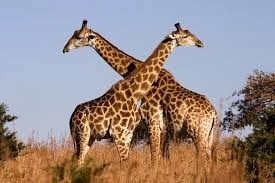 More commonly known are the African folktales that have evolved over the many beliefs of how the species developed their long necks. They have also been known to be kept as pets by the Egyptians and even shipped around the Mediterranean. African tribes hunted giraffes as a source of food. Other body parts were found to be of use to mankind as well. Their tail hairs served as flyswatters, bracelets, necklaces and thread. Shields, sandals, and drums were made using the skin while the strings of musical instruments were from the tendons. Their burning skin was even used by medicine men of Buganda to treat nose bleeds. In the 19th century, hunting giraffes became a sport to European explorers.